care for them in times of ill health and old age. In this way, as well as by your prayers, you share in our missionary work throughout the world. May God bless you for your generosity! Sister Rabunna Bakineti, from Kiribati, with students she's been teaching at Mt Alvernia High School in Montego Bay, Jamaica. Sister has now moved to Kingston to begin her Masters Degree in Counseling at MICO University. Sr Esther N'Sanda, from the Democratic Republic of the Congo, has been working in Jamaica as a pastoral minister for several years. She has now begun her professional studies as a teacher at St Joseph's Teacher Training College in Kingston. Three of our senior Sisters - Sisters Immaculae Carroll, Sylvia Kircher and M. Michaeline Medzihradsky - all veterans of mission in Papua New Guinea and the Solomon Islands - enjoy a celebration at the Marillac Residence in Wellesley Hills, Massachusetts. Marist Missionary Sisters established a transitional home in southern California for women who had escaped from human trafficking in 2005. Since then, women from many parts of the world have been helped to establish a new life, free from slavery. Your donation will help to advance this mission. Give to "Mary's Guest House"
Girls dancing during a break between exams at Buahngija Secondary School, Tanzania. 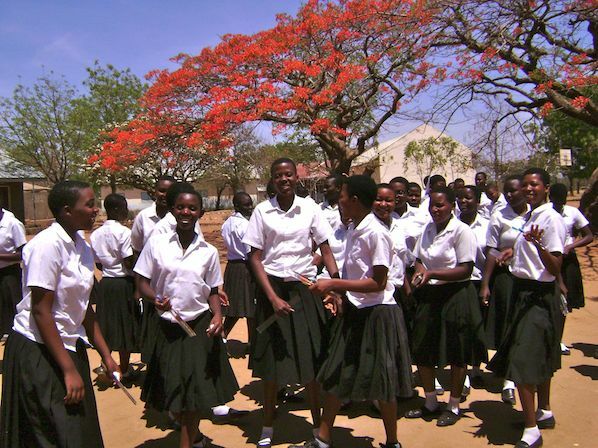 A contribution to this school, staffed by Marist Missionary Sisters, will help change the lives of the younger generation in Shinyanga, Tanzania.